Real Estate Professionals understand that having a successful Internet Strategy is important but getting the right ideas and habits are few and far between… this course intends to answer the fundamental questions and offers a Plan of Action that Realtors can trust to design an organic Real Estate Internet Strategy driven by the needs of their Buyers and Sellers. This is a true Real Estate Training - nothing will be sold nor does the trainer affiliate with any vendors - your Realtor Colleagues who have taken this training are producing results; shouldn't you? Do you plan to get a website? Do you have a website that’s stagnant? Do you feel overwhelmed with the whole endeavor? This is the Seminar for you... many of you have sluggish websites that are not producing any results... so what to do? What is Internet Marketing? and how does "Extreme Niche Marketing" help me grow my business? Should you get a Real Estate website? And why? How do you select the best Web Services? What are the important tools of a Real Estate Website? What is IDX? And do I need it? Shouldn’t I just use my MLS IDX? And what is Sticky IDX? How about Blogging? Is it important? "Dear Key, I wanted to let you know that your training has impacted my business’s GOOGLE visibility tremendously. I attended two of your trainings and APPLIED everything you taught with the result that I am now dominating my local area on Google searches… I’m actually taking the first TWO pages.. I have spent the last 2 years in total frustration at HOW TO DO this, and when you came to Franklin, you brought “THE LIGHT with you! Thanks Key for sharing this knowledge, I look forward to more “skull sessions” in the near future.. If you have students “IN DOUBT”, have them Google: john becker bald head, or Franklin nc real estate .. let the magic begin! Key, I also wanted to thank you for making this training AFFORDABLE to ANYONE who wants to learn this aspect of web marketing. I’ve seen so many other “web trainers” who charge astronomical fees with less than satisfactory results." - John Becker / Bald Head - Franklin NC. Attended Real Estate Web and Blogging Strategy Trainings. 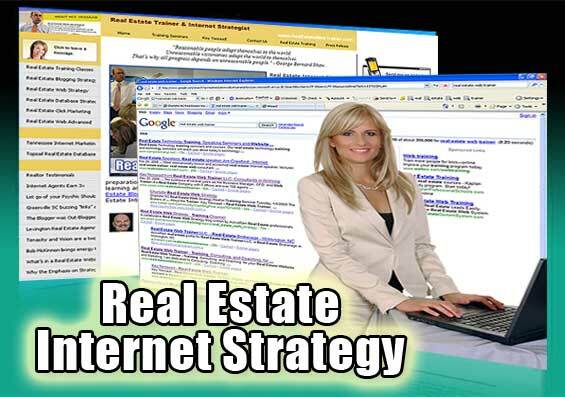 Real Estate Internet Training, Real Estate Internet Trainer, Real Estate Web Training, Real Estate Internet Strategy Training, Real Estate Internet Marketing Training, Real Estate Training, Real Estate Web Trainer, Real Estate Web Strategy, Real Estate Internet Marketing Strategy Training, Key Yessaad Trainings, Real Estate Blogs.